A librarian's laugh-out-loud funny, deeply moving collection of love letters and breakup notes to the books in her life. If you love to read, and presumably you do since you’ve picked up this book (! ), you know that some books affect you so profoundly they forever change the way you think about the world. Some books, on the other hand, disappoint you so much you want to throw them against the wall. Either way, it’s clear that a book can be your new soul mate or the bad relationship you need to end. 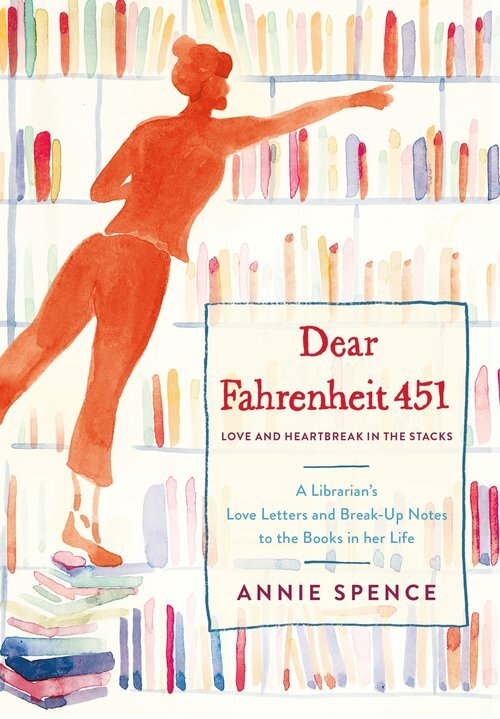 In Dear Fahrenheit 451, librarian Annie Spence has crafted love letters and breakup notes to the iconic and eclectic books she has encountered over the years. From breaking up with The Giving Tree (a dysfunctional relationship book if ever there was one), to her love letter to The Time Traveler’s Wife (a novel less about time travel and more about the life of a marriage, with all of its ups and downs), Spence will make you think of old favorites in a new way. Filled with suggested reading lists, Spence’s take on classic and contemporary books is very much like the best of literature—sometimes laugh-out-loud funny, sometimes surprisingly poignant, and filled with universal truths. A celebration of reading, Dear Fahrenheit 451 is for anyone who loves nothing more than curling up with a good book...and another, and another, and another! Why Did I Listen To Dear Fahrenheit 451 by Annie Spence? Dear Fahrenheit 451 by Annie Spence initially caught my interest on the lovely Netgalleys because it is a book about books! As a book lover, that’s kind of the most meta you can get. Am I using the term meta right? Do I even care? Okay so, I am the worst with procrastination and waited and waited to read this book. THEN I saw it was available at my library on Overdrive as an audiobook and that is exciting because I can read it faster. AND THE AUDIOBOOK is mad short. I went to check it out and you guys. YOU GUYS. I must have a neighboring book stealer or something. Someone else grabbed it and I had to put a hold on it. (Also on a bunch of other audios I wanted to listen to that were curiously available to the previous day) So annoying. Anyways okay so I finally got this book in AND YES IT IS SO SHORT AND EASY TO LISTEN TO. Essentially this audiobook, Dear Fahrenheit 451 is set up in that the large majority of it consists of letters written by Annie Spence to different books. She is a librarian. Some of the letters are to books she’s weeded. Some are to books that people keep recommending to her that she is not interested in. Others are to books that have truly shaped her (my favorites were to Matilda and The Time Traveler’s Wife). Then at the later section of the book are recommendations of what to read from Annie Spence. Like, a lot of recommendations in different categories. How Did I Like This Book? Okay, so there’s profanity. That doesn’t bother me because I swear like a sailor (like today driving from the mall — related note: why don’t people LOOK BEFORE THEY GO FROM A STOP SIGN). I actually really enjoyed this book. I know we all think we are super well read (I know I am well read, the amount I read in a year is 150 on the low end , 300 on the high end). Annie Spence though makes me feel like I have met my match with another person who reads as much. At the end I basically was just adding her recommendations to my TBR. The thing I liked most was that this book made me excited about reading more books and being a mood reader again. So, the audiobook of Dear Fahrenheit 451 is narrated by Stephanie Spicer. We did not start off a great foot. Maybe I am the odd duck, but I have always pronounced the title “Fahrenheit Four Fifty One” this narrator pronounced it “Four Five One” which drove me up the wall. I just, no. No no, that is wrong. Or maybe I am wrong? Anyways I was irrationally annoyed by that and felt a little judgmental. Beyond that though, Spicer is a charming narrator. And this is super fast and easy to listen to.